This sister clearly has a bad habit (sorry, I couldn’t help myself). As this security camera footage from an Oklahoma convenience store shows, this elderly woman dressed as a nun smuggles not one, but two tall boy cans of beer or malt liquor under her robe. She also appears to tuck a bottle of fitness water in her garment as well, showing that she understands one must stay hydrated when pounding tallboys. Good for her. – Is it a Halloween costume? This is probably the best hope for folks who don’t want to live in a world where Sisters have sticky fingers. Maybe she’s just an old lady who is short on cash and on her way to a rocking BYOB Halloween party. 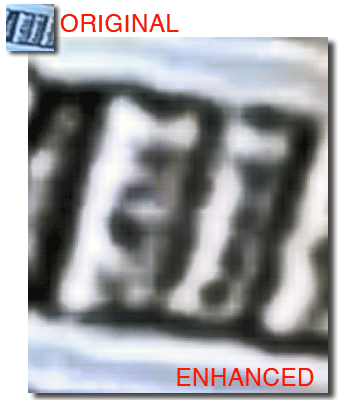 I don’t think this is the case, as the video linked above was posted on October 6th (early for Halloween parties) AND the date stamp on the video reads 2012-09-10, at 09:13 hours, which indicates that our naughty nun was recorded on September 10th at 9:13am, which takes Halloween out of the occasion. It’s also really early to be out stealing beer, but that’s certainly not the weirdest thing about what you see above. – Is she a real nun? 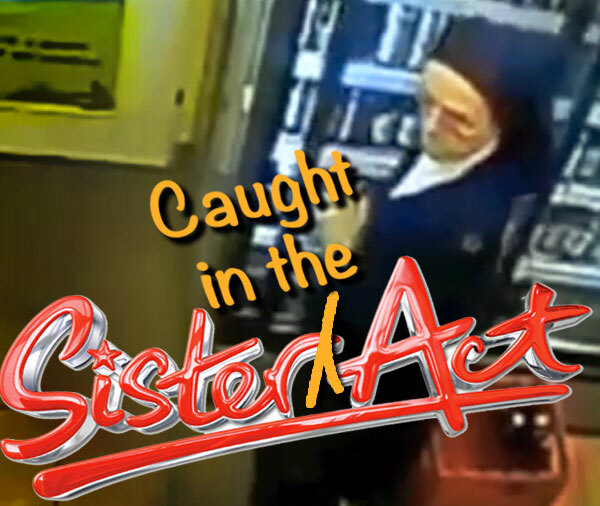 Okay, so you don’t have to be on your way to a party to pose as a nun – maybe she’s simply a clever shoplifter who thinks that dressing as a member of the church will allow her to move about without suspicion while providing ample room to hide her ill-gotten goods under her tunic. While this seems plausible, the woman in the video looks so comfortable in those robes, like she’s been wearing them for years. She REALLY looks like a nun, like if you were making a movie about nuns (maybe like a more realistic version of Sister Act where no one sings and there’s lots of corporal punishment) this lady would play the Whoopi part. She appears to be 100% authentic to me , except for the whole committing a crime thing, of course. – Is this a hoax? There’s been some speculation across the interwebs that this video is a hoax, but I ask one simple question – why?! Who gains anything from this? It’s not even a little funny (in fact it’s kind of sad), so it’s not likely to drive traffic to a humor site. The store where it was shot has nothing to gain, short of showing that they keep an eye on the beer coolers, so you’d better not try and nick a brew or two. Maybe people who are anti-church might be able to point to the footage and say this is what happens when you repress a person’s ability to live a “normal” (and by that I mean “mildly hedonistic”) lifestyle. But even that’s a stretch. No, the only person who gains anything here is the woman in video, who gets two free tallboys and a complimentary soft drink. – What kind of beer did she steal? This is what I really want to know – when a nun steals beer, what kind of beer does she steal? Unfortunately, it looks like the answer is “a bad one.” While I’m not a cheap beer expert, a look at an enhanced screen grab of the two beers lifted by the Sister reveals a tall, mostly silver can. My best guess here is it’s either Steel Reserve or Hurricane High Gravity lager, both 8.1% ABV frat-boy specials designed to provide cheap thrills, which become less thrilling when you take into account Oklahoma’s strict beer laws which prohibit convenience stores from selling cold beers having over 4% ABV (and even cheaper when you steal them). It may also be a 24-ounce can of Coors Light – it’s really hard to tell. In the end, I think what we have here is a real nun with real problems. Not only is she breaking the law, I’m sure she’s also breaking some kind of vow to abstain from such earthly pleasures, not to mention the whole “Thou shall not steal” thing. And while I’m tempted to say she HAD to steal the the beer because she’s a nun and it makes a bad impression when such a person buys a couple of tallboys at 9:13am on a Monday morning, she also pilfered a water, which is fine for everyone to drink. As of this posting the nun remains on the lamb. Looking at how this lady rolls, it probably wouldn’t be the first time she’s had a little Trappist in her! Anyone have a nun outfit i can borrow? The beard will totally help sell it, Daniel. I actually read in another article that it was “the lord’s drink”………4 Loko. First thing I’d have to ask is is that a habit from a known order? If not, could she belong to some local cult or other, or as you say just dressed up for the part? After all, even an atheist clerk is unlikely to give a Nun the shop-lifting stink-eye. I certainly wouldn’t have been watching a nun for potential shoplifting when I worked in a liquor store. Though not RC myself, I grew up in a Polish neighborhood in Chi and most of my cousins (and 1 sister) are RC, so I’ve always had a healthy respect for nuns. Now if that were a guy in priestly garb it’d be a different story as many of the ones I knew were total lushes. This tendency to let down your guard around members of the Church — or a church — amazes me. If anything you should be MORE on guard having a heightened state of awareness. If Sister Beer did lift a Steel Reserve tall boy, I would say her punishment is in hand. “As of this posting the nun remains on the lamb.” Where was the baby sheep in this video? That would be an even better Halloween costume!